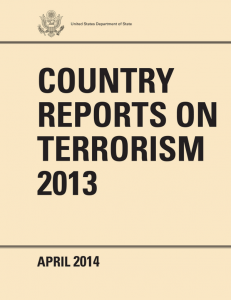 The US State Department Bureau of Counterterrorism released its 2013 annual report on terrorism yesterday. Unsurprisingly, it mirrored much of what we have seen in terrorism news over the past few months: namely, that while al-Qaeda’s core leadership has been degraded and the movement decentralized, the affiliates are becoming more of a threat. It also assesses North and West Africa, highlighting al-Qaeda in the Islamic Maghreb (AQIM), the al-Mulathamun Battalion (AMB) led by Mokhtar Belmokhtar, Ansar al-Sahri’a in Tunisia and Libya, and Boko Haram, which has moved beyond Nigeria’s borders and is increasingly threatening Chad, Niger, and Cameroon. Libya: “The terrorist threat to Western and Libyan government interests remains strong, especially in the eastern part of the country. Libya’s porous borders, the weakness of Libya’s nascent security institutions, and large amounts of loose small arms create opportunities for violent extremists.” This is exacerbated by the presence of new armed groups in the region, coming from Mali and elsewhere (and recent news that Belmokhtar is operating in Libya). Mauritania: “Mauritania is not a safe haven for terrorists or terrorist groups, although regions in the interior are imperfectly monitored due to their geographic isolation from population centers and inhospitable desert conditions. Al-Qa’ida in the Islamic Maghreb (AQIM) remained a leading threat to Mauritania in 2013.” It remains to be seen if terrorist groups will seek to disrupt elections later this year. The report also assesses the strength of terrorist groups operating throughout the world. 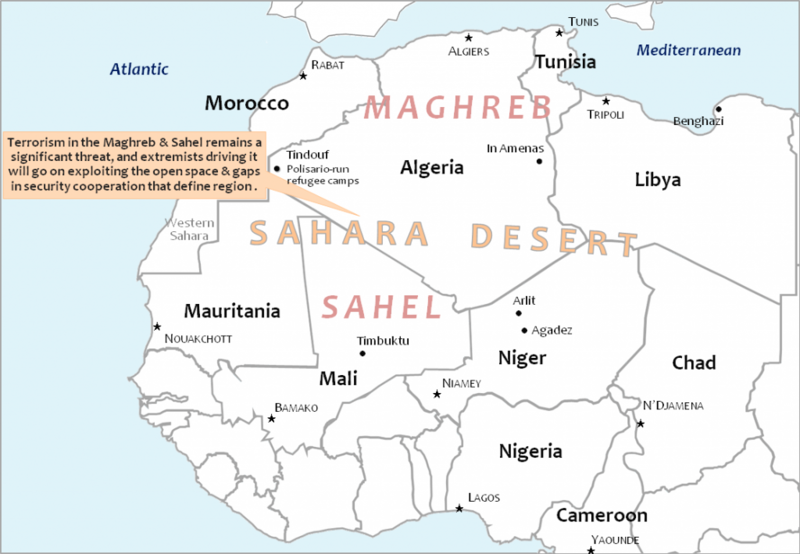 In the Maghreb and Sahel, 2013 brought some important developments: in March, Ansar Al-Dine was designated as a foreign terrorist organization, and the al-Mulathamun Batallion (AMB) received the same designation in December. The report offers little insight on Ansar Al-Dine, noting only that it is fractured as a result of the French intervention in Mali, and that the strength of its membership was unknown at the end of the year. The same applied to AMB, though the report does warn that its August 2013 merger with the Movement for Oneness and Jihad in West Africa (MUJAO, designated as a terrorist organization in late 2012) to form the al-Murabitoun terrorist group “constitutes the greatest near-term threat to U.S. and international interests in the Sahel, because of its publicly stated intent to attack Westerners and proven ability to organize complex attacks.” This assessment is most likely due to the January 2013 large-scale attack against the Tiguentourine gas facility near Amenas. AMB’s merger with MUJAO certainly presents new challenges. Though there have not been any attacks attributed to the group since the merger, the two cooperated in May 2013 twin suicide bombings in northern Niger against a military base in Agadez and a French uranium mine in Arlit that killed nearly 20 people altogether. If that is a sign of their joint capabilities, the US should be increasingly concerned and is right to designate it as the biggest threat to the US in the Sahel, particularly given its move to Libya and that country’s increasing slide into chaos. In my view, this statement (and a recent New York Times article) understates the threat – and the capacity of AQIM to regroup. A peaceful outcome in Mali looks likely, but is not yet guaranteed, and for the movement, Libya looks wide-open as a safe haven. And regardless of how it is evolving, there can be no doubt that terrorism remains a significant threat, and the extremists driving it will go on exploiting the open space and gaps in security cooperation that continue to define the region. Indeed, to that mix should be added a deeper commitment to regional development, an increased effort to reducing trafficking that helps finance terrorist activity, and a determination to finally resolve the Western Sahara conflict that continues to drive a wedge between Morocco and Algeria.